It has been a long journey trying to stick to a limited diet based on Donna Gates’ Body Ecology Diet. I started Stage 1 two years ago. And transitioned to State 2 as I thought I was ready. Boy, was I wrong! So, here I am again, plugging away on Stage 1 of BED! And when one’s diet is limited, creative juices start to flow. Thank goodness! Otherwise, I will not survive this diet! In able for me to be successful in this stage, I need to plan ahead. But there are times when I am not able to menu plan. But do try to stock up on the ingredients I know I can eat. So I try to make what is readily available in my kitchen. Here’s a recipe I eventually came up with based on BED. And thought I’d share it since it turned out sooo good! And you can change the measurements based on your preferred taste. Place defrosted hake loins in an oven dish. Poke holes in loins with a fork (to allow EVOO and lime juice to penetrate the fish. Drizzle each fish with lime juice and EVOO. Dip each fish in the whisked egg (optional). Mix last three ingredients. Coat fish. Bake at 400 degrees F for 35 minutes or until golden brown on the outside and flaky on the inside. Use a fork to test for doneness. Clean brussels sprouts. Cook whole or cut in halves. Drizzle a tbsp of coconut oil on pan at medium high heat for less than a minute. Sautee garlic and onions for 1 minute. Mix in cleaned brussels sprouts. Season with the last three ingredients to desired taste. Sautee for 15 min or more. Check with a fork to see if brussels sprouts are tender on the inside. 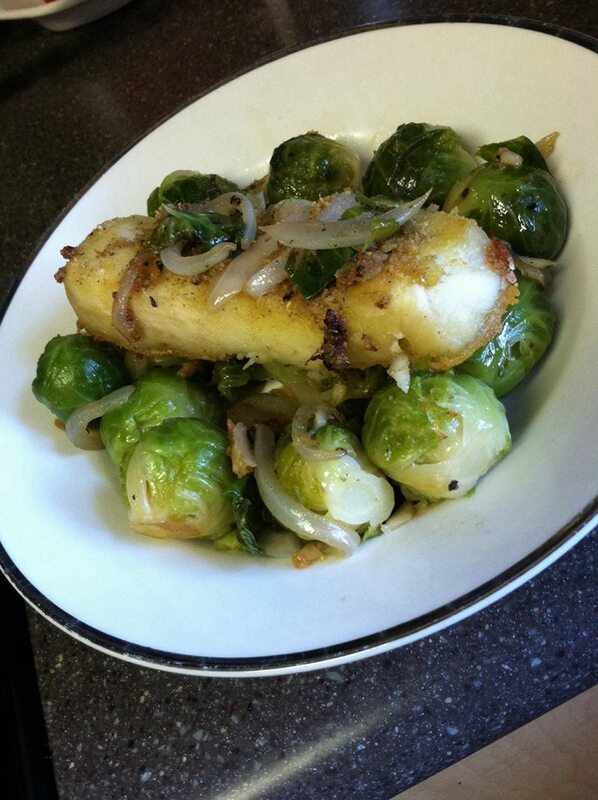 Place a bed of brussels sprouts on a serving dish and top with the loins. And strew sauteed garlic and onions on each fish. Serves 5 to 6 people. Next Next post: How RAW/Live Foods Are Saving My Life!